The world is not upside down; So what if we have yield inversions? In a centrally-managed economy, the entire yield curve is controlled. The central banks must make certain that the governments remain in business, regardless of their fiscal policies, so long as it achieves their desired long-term objectives for a socialist new world order. Longer-dated U.S. Treasury interest costs were getting too expensive, so the Fed needed to lower longer-dated bond yields. If these rates drop below short-term yields, so be it. Yield inversions no longer mean the same thing anymore. A weak economic backdrop provides the central banks with plenty of reasons to maintain QE and their dovish policies. The central banks need to temper the global economic growth rate; any inflationary forces would undermine their ability to keep the governments in business. The weaker the economy, the better. Top candidates can already borrow below 4%. Mortgages will continue to get cheaper, since that is a direct result of the Fed’s primary objective. If the Fed determines that sinking the economy is in its best interest to achieve its primary objective (keeping the U.S. government in business), so be it. The total sum of negative-yielding debt in bond issues represented in the Bloomberg Barclays Global Aggregate Bond Index AGG, +0.50% stood at nearly $9.7 trillion, marking a more than 50% increase from September. Since the New Year, I have been a buyer of U.S. Treasuries on any dip. If I were a U.S. Treasury trader, since December I would have been buying every U.S. Treasury security not nailed down. Why? The owners of the U.S. Fed made it clear late last year that their tightening experiment was abruptly coming to an end. All the markets responded well, with the longer dated Treasury market responding the most favorably. The more the Fed members speak, the more dovish they become. Recall last year, we thought the banking families and owners of the Fed wanted to blow things up, since the Fed’s monetary policies were inimical to achieving its primary objective. We knew that the global central banks could never cease QE in its many forms, despite what they were claiming. This also includes the PBOC. In hindsight, it was all a thought experiment, because the elites are not ready to pull the plug. This monetary system can be maintained for years. 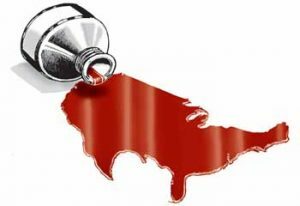 So what if the world is drowning in a sea of government red ink? Primary Fed objective: Do whatever it takes to keep the United States government solvent and in business, with the Fed in control of the process. This means that the Fed must make certain that bond yields decline, so that interest costs stay reasonable (as a precent of GDP). Thus, it will begin a dovish campaign of lower rates and further asset purchases. Who else will absorb this extra supply? Besides, the Fed returns its investment income to the U.S. Treasury. The more Treasuries the Fed holds, the cheaper it is for the U.S. government to borrow. Secondary Fed objective: Keep the country out of recession, maintain stable prices, and minimize unemployment rolls. Why is this secondary? It is an objective as long as it allows the Fed to achieve its first objective. If the Fed determined that its best course of action to attain its primary objective was to sink the economy, it would do so. The economy is hostage to the Fed’s primary objective. I have been warning the reader that over the past several months I have observed how the global monetary authorities are no longer discussing the concept of asset bubbles. The topic has taken a back seat to the Cassandra calls of recession. If you scared about collapsing house prices in Australia, the monetary authorities have an answer; more monetary stimulus. China Central Bank Balance Sheet -China is doing its part to inflate the asset markets. Imagine what else the ChiCom government is doing to hide bad debt. This is the tip of the ChiCom iceberg. The European Central Bank launched another round of stimulus for eurozone banks at its last meeting, in part justified by the cut to growth expectations for the 19-member bloc to 1.1% in 2019, from a previous 1.7%. The Reserve Bank of Australia has increasingly voiced its doubts over the economic outlook amid a China slowdown and a soft property-market, stirring market expectations for a rate cut versus an interest-rate hike. And the Swiss National Bank kept rates on hold at its Thursday meeting, trimming its inflation expectations. Investors in Canada’s debt market are becoming more convinced that the next interest-rate move from the country’s central bank will be down, with bonds due in more than a decade now yielding less than cash. An investor has to be willing to lend for around 14 years in order to get more than the 1.75 per cent rate that the Bank of Canada currently has as its overnight benchmark. While Canadian bonds due in 2033 on Thursday yielded around 1.79 per cent, securities maturing in June 2029 offered a rate of just 1.67 per cent. My warning to the reader; assets priced off the yield curve (e.g. businesses and real estate) will move higher despite affordability concerns. Have plenty of cash on the sidelines, low leverage on our assets, and no debt that does not have offsetting income. Be ready for any asset bust. With the central banks telegraphing their intentions, we would be foolish not to listen. Don’t be a victim of central bank policy. Stay ahead of the game.